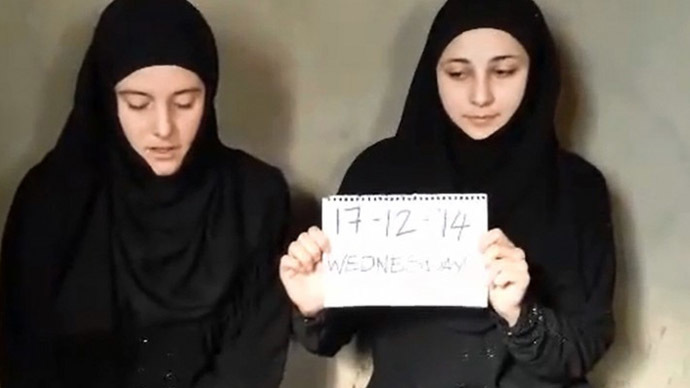 A freshly released video apparently shows two young female aid workers abducted in Syria last summer, appealing for the Italian government to save their lives. The Italian Foreign Ministry declined to immediately confirm the authenticity of the video. Italy’s La Repubblica newspaper talked to Marzullo’s father, Salvatore, who said he had “no words” in response to the video. Marzullo and Ramelli, both 21, were abducted near Aleppo in northern Syria on the night of August 1, three days after arriving there with a humanitarian mission. For both it was their second trip to the war-torn country. Since then, the two women have been reportedly sold on by several militant groups operating in Syria, La Repubblica says, citing Arab media. They are believed to be currently held either by the Al-Qaeda-linked Al-Nusra Front or their fearsome allies, Islamic State. Among their other atrocities, Islamic State is notorious for staging executions of foreign hostages for propaganda videos. It was not immediately clear whether the Christmas deadline set in the statement was observed, or whether missing it resulted in any repercussions for the hostages.